So, I haven’t eaten eggs, tomatoes, peppers, white potatoes, eggplant, grains, dairy or nuts in about twelve days. I’m doing a bit of an elimination diet in order to detect some suspected food allergies. I’m not going to lie to you, it could be easier. In the past twelve days I’ve realized I feel slightly paralyzed without eggs and I put tomatoes in nearly everything. But, in the hopes of not freaking out and attempting to sell my kidney on the black market for a plate of runny-yolked gold, I’ve been trying my best to make satiating meals that aren’t lacking in flavor. However, I’d like to reiterate that taking away things like tomatoes and chili powder and paprika make me feel like I’m cooking with a couple of those lobster claw oven mitts on. A little clumsy. A little frustrated. A little confused as to why I have lobster claws instead of hands. I’m sure there were like a zillion better, more coherent similes that I could have used right there. But, of course, I went oven mitts. Oy. Enough complaining. No more weirdness about lobster mitts or hawking a kidney for eggs. Let’s talk about this beautiful bowl of soup. This soup is EVERYTHING. This soup made me want to high five my taste-buds in a blaze of “oh, my gosh, this lacks nothing” glory! This, my friends, is what triumph looks like. 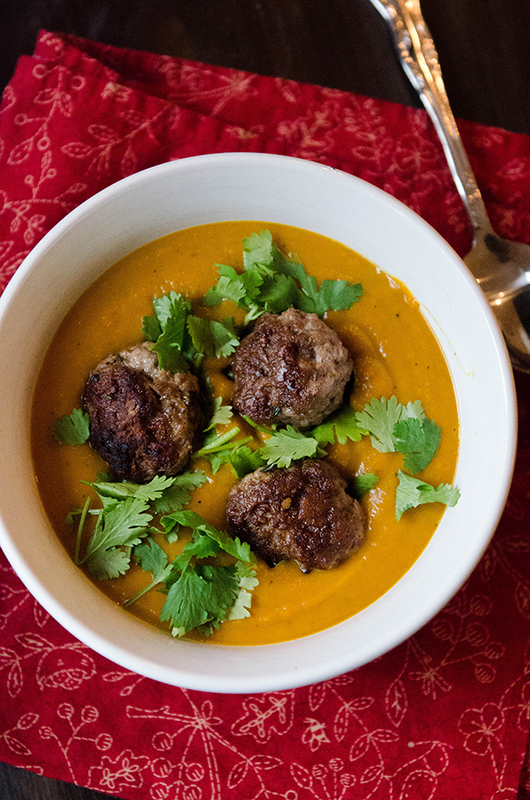 A flavorful explosion of fall and meatballs and herbs and spice and lime. No diggity, no doubt. It all starts with roasting. See that little charred bit of onion? I ate it like a potato chip. Desperate times call for desperate measures. Who are we kidding, I probably would have done it anyway. It was delicious. 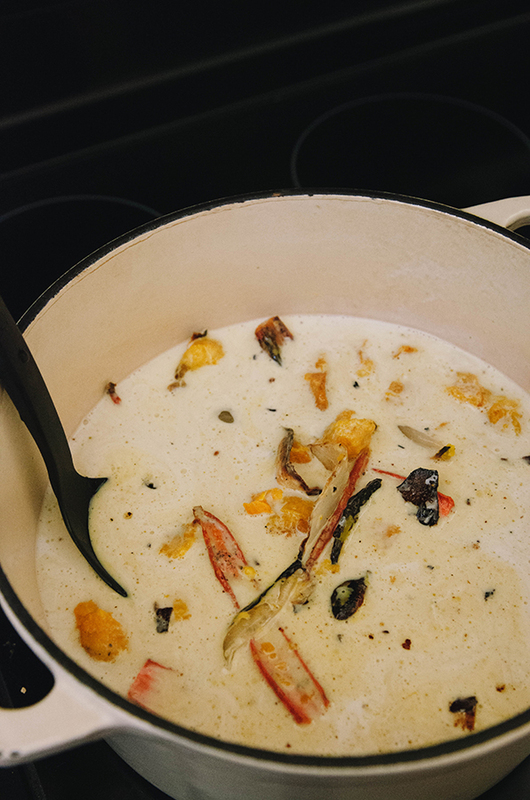 Roasted veggies and scooped-out squash meat come together with chicken broth and coconut milk in order to make one big simmering pot of “this kind of looks like soup-y garbage”. Don’t worry, things will get much more aesthetically pleasing soon. We’re going to employ the help of my good friend the immersion blender. It all becomes a creamy dreamy orange bowl of hot-hot love. Now, if I’m honest with you, I’ve never been a huge fan of creamy soups. They taste good. I won’t deny that. But, they always seem to be too sweet or lacking in something to make it a meal. For me, this is protein. That’s where this meatball comes into play! Ta-daaaaa! Meal. Just like that. The soup is prepped. The meatballs are ready. The herbs are chopped. My tummy is grumbly. Shall we eat? Yes. I think we shall. I’m actually roasting more squash to make this soup AGAIN as we speak. I might be a little bit addicted. No big deal. Line two baking sheets with tin foil and set aside. Cut up your carrots, onions, and seeded kabocha squash into large chunks. Toss with melted coconut oil, salt, pepper, ginger, and cloves. Make sure all of the veggies are coasted evenly. 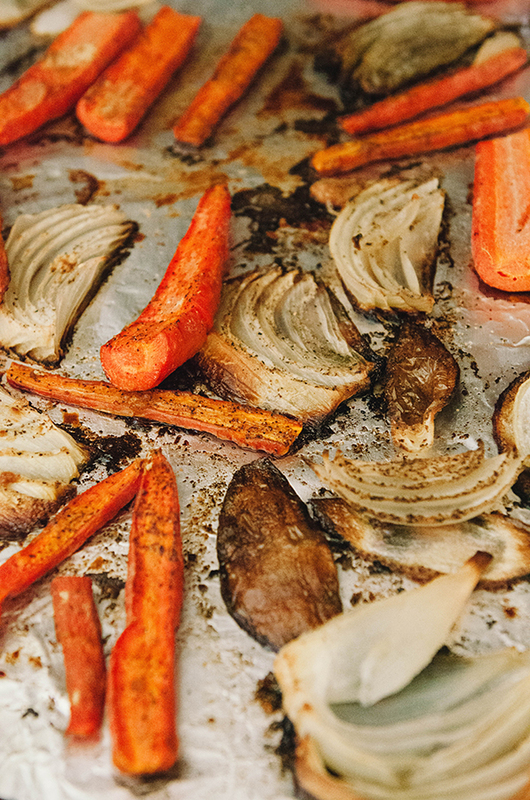 Lay out the veggies onto the baking sheets along with the whole cloves or garlic and allow to roast in the oven for 45-60 minutes or until the veggies are fork tender. You should be able to scoop the squash away from the skin easily. Once the veggies are done take them out and allow them to cool until they are no longer too hot to handle with your hands. Add the carrots, onions and garlic to a heavy bottomed soup pot. 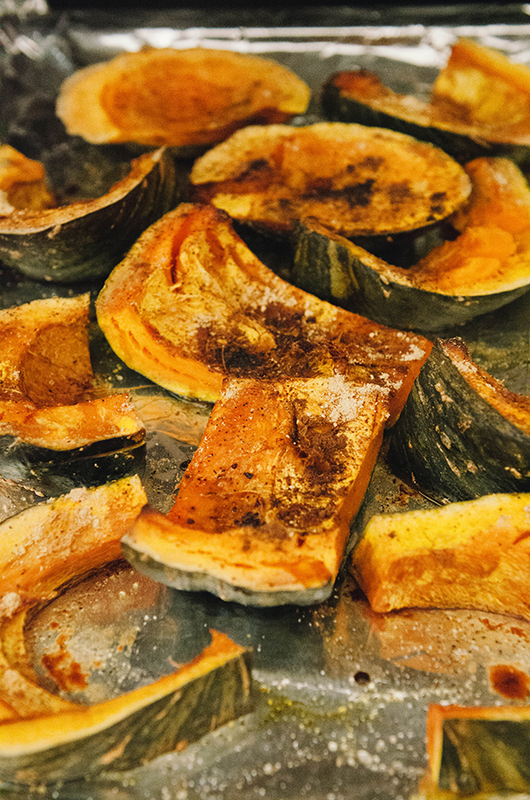 Scoop out the meat of the kabocha squash, discarding the skins. Add the scooped out cooked flesh of the squash to the soup pot with the other roasted veggies. Add the chicken broth, coconut milk and freshly grated ginger to the pot with the veggies. Allow to simmer over a medium heat for 20 minutes or so in order to allow the flavors to marry. 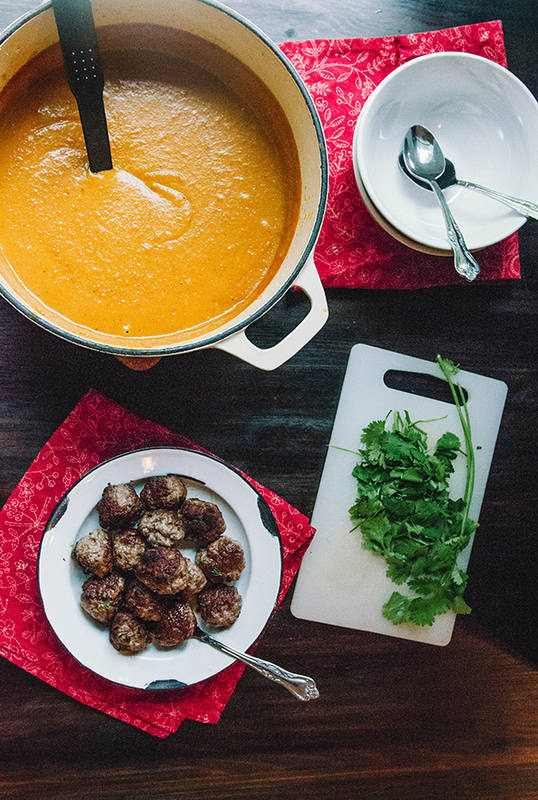 While the soup is simmering, start on your lamb meatballs. Add the ground lamb and spices to a bowl and combine well with clean hands. 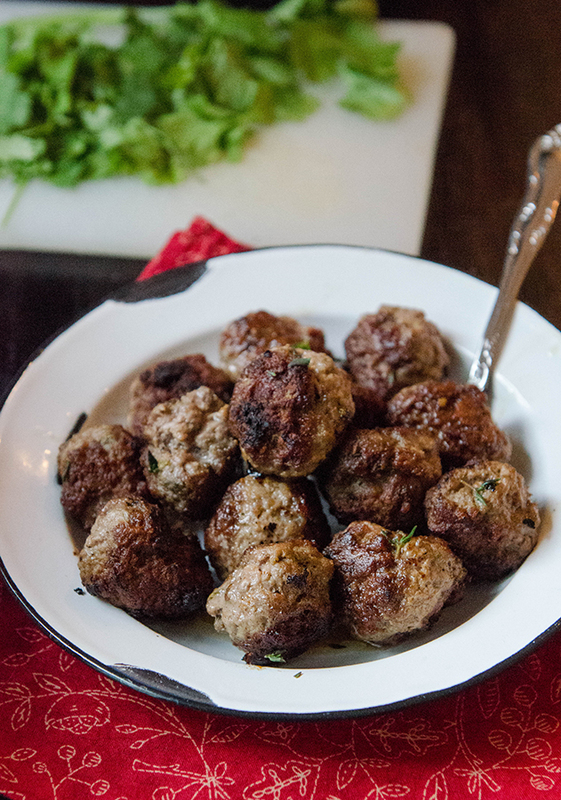 Once the lamb and spices are well combined, portion the lamb into 12 equal portions and roll them into small meatballs. Place a pan on the stove and heat a tbs of coconut oil over medium heat. Once the oil is hot, add the meatballs to the pan. Allow them to cook, rotating every couple of minutes in order to cook them fully. Once your soup has simmered for 20 minutes, remove it from the heat and using an immersion blender, blend the soup until it is completely smooth and creamy. After the meatballs are cooked through, you are ready to serve! 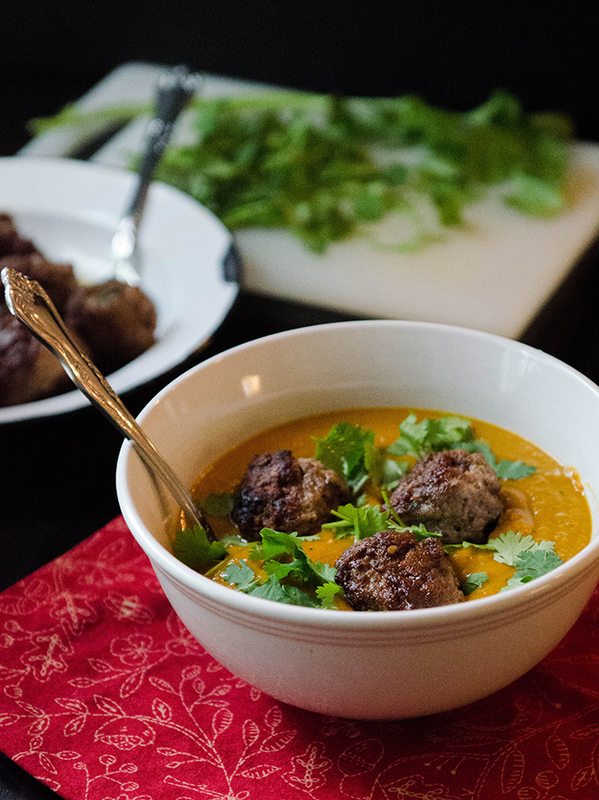 Fill a bowl with soup, add a couple of meatballs to your bowl of soup and garnish with cilantro and the juice of half a lime (trust me on the lime juice, it's amazing). Enjoy! I had this recipe down pat until I got to “…clean hands.” Who has THOSE? Jk. I like cleanliness in my kitchen AND I like eggs in your tummy, so I hope you’re not all ovo-tarded and such. Meatballs!!!!! Found you via the lovely Simone at Zenbelly. This dish looks AMAZING! Bookmarked down here in Sydney. Cheers! Oh, I do love that Simone! 🙂 Welcome! Just made this for dinner. I didn’t have kabocha squash, so I used butternut, and I didn’t have lamb, so I used beef. I think it would have been better with kabocha and lamb, so next time! I also think I needed to thin out my soup a bit more with some more chicken stock. But all in all, it’s delicious! Reminds me of curry. I love it, will be making it again, but with kabocha and lamb. Made this today on a chilly, rainy autumn afternoon for lunch. My exchange student from Mongolia even liked it! Winning! Will definitely make it again – delicious, healthy and simple. Oh my god! This looks sooo good I could have it right now. It’s 9am and I’ve had a bowl of porridge barely an hour ago! Even veggie bowl would be great in it. Excited to make this for a dinner party! How many servings does this recipe produce? It depends how hungry you all are. I would say it could feed six people. I’ve looked everywhere and can’t find kabocha squash. What is a good substitution? You could use butternut squash or a pie pumpkin. I just made this with acorn squash and it was phenom. I have made this several times, following directions to the T, and we absolutely love it! Sometimes I have to substitute with butternut squash and still turns out great. One of my keepers for sure. I just made this soup. I used butternut and organic ground beef since I don’t like lamb and the grocery store was out of kobucha. It was fantastic!! And the lime and cilantro are definitely worthwhile! Loved loved loved it! I just made this last night and I cant even believe how delicious it is. I used Butternut squash since that is what my store had and i doubled the meatball recipe since you can’t ever have too many lamb meatballs. thank you for this recipe and thank you for telling me to squeeze some lime juice on it. Amazing!! I just made this and it is RIDICULOUS. even though I keep telling him, it’s the recipe that’s so good, my boyfriend is really proud of me for cooking something so delicious and healthy at the same time (he doesn’t usually love the healthier foods I make). This will become a staple. Wow, the perfect balance. This was DELICIOUS!! It was a bit labor intensive with that kabocha squash but so worth the effort. For anyone who had trouble finding those squashes, I found them at the asian market. None of the local grocery stores sold them. Hi! This recipe looks delicious! Is this a 4 servings recipe? I just bought two kabocha squash for the first time but they seem pretty small. How large is a medium one? How many cups do you expect to get from it when cooked? Thanks! this is a wonderful recipe! My only caveat is the meatballs are tough but i will try them with some flax meal/water (for an egg texture). this won’t spoil t he elimination part of it but will make them moist and tender. it’s also a gorgeous dish to present to the table. This is so freaking good! I too am having a no nightshade panic. I’m on day 23 of whole 30 and still having some tummy issues. Hoping the nightshade elimination helps that. Thank you for this! This has become a favorite winter meal whether on Whole 30 or not. The bright flavors of the lime and cilantro are a perfect pair with the hearty winter veggies and meat. It’ll both warm up and perk up an otherwise dreary winter. We’ve subbed the kabocha squash with a small butternut (Trader Joe’s carries the perfect size, which is organic, I think) and it works beautifully. In a pinch, or on weeks when we need to be a little friendlier to the wallet, we’ve also subbed ground turkey for the ground lamb. The taste is not quite as amazing, but the meatballs are tender and it’s still pretty high up on the satisfaction scale! The soup recipe makes a lot, so another trick to make it last longer is to make the meatballs about half the size recommended, and you can have about 3/4 the amount of meat you normally would, extending the servings possibly by another meal or two. Thanks for your great blog!! I’m rarely moved to leave a comment on a food blog, but I had to write to say how fabulous this is. I used olive rather than coconut oil since we’re not doing W30. I was surprised there was no binder of egg or bread crumbs in the meatballs, but they held together perfectly and were outstanding. My husband and seven year old loved it too! My old immersion blender couldn’t handle the big veggie chunks, so I used a blender to puree the soup. It was really think and creamy. Awesome. Would it be possible to bake the meatballs instead of cooking them on the stove? Absolutely my favorite soup! The spice combination is phenomenal. This time, I made extra veggies to eat with the tomorrow’s dinner. I fin lamb too strong for my taste so I mix it half and half with either ground beef or ground chicken. I still get the lamb, just not as strong plus it’s more budget-friendly. I made this for a 21-day sugar detox and LOVED it, so much so that I made it again during the three weeks and it will go into my “make regularly” pile of recipes (which isn’t very big because I’m constantly trying new things) – I don’t personally like lamb, so I used beef, which was, to me, more delicious. Thank you for this awesome recipe! I (randomly) had all the ingredients for this recipe, even though my fridge was empty. It was delicious. Even my husband liked it, even though he instantly turned up his nose when he saw the squash going into the pot. Ha ha. Has any one tried freezing this recipe? How well does it hold up?